Independence Day is celebrated on August 15, to commemorate its independence from British rule and its birth as a sovereign nation. The day is a national holiday in India. All over the country, flag-hoisting ceremonies are conducted by the local administration in attendance. The main event takes place in New Delhi, where the Prime Minister hoists the National Flag at the Red Fort and delivers a nationally televised speech from its ramparts. Independence Day, August 15, commemorates the day in 1947 when India achieved freedom from British rule. The day is celebrated to commemorate the birth of the world's biggest democracy as a national festival. At the stroke of midnight, as India moved into August 15, 1947, Jawaharlal Nehru, India's first Prime Minister, read out the famous speech proclaiming India's independence. The moment ended the 300years rule of the British. It also created a situation where we were responsible for ourselves. It also created a situation where we were responsible for ourselves. It wasn't a period of unqualified joy. For a lot of people, in spite of a new era promised by independence, partition was a painful reality and so was the bloodshed that accompanied. August 15, Independence Day, is celebrated in a mood of abandon and joy - no rituals, just festivities. It is also a national holiday so educational institutions, private and government organisations remaining closed, after the official celebrations in the morning is over. Schools and colleges mark the day with cultural activities, drills, flag hoisting and distribution of sweets. Government as well as private organisations celebrate it. There is a tradition of flying kites on the Independence Day. The sky is dotted with hundreds of colourful kites and people engage in kite-flying competitions. Kites painted with the three colours of the national flag are a hot favourite. 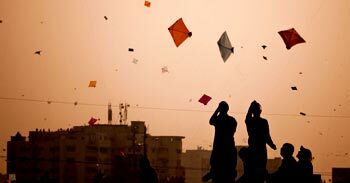 Balconies and roof-tops of houses are full of people flying kites and one can hear cheerful shouts of children in the evening as the kites soar in the sky.